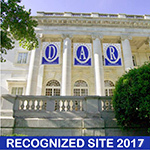 The Sego Lily Chapter, National Society Daughters of the American Revolution (NSDAR or DAR), welcomes you to our website! In 1976, the Sego Lily Chapter NSDAR was established in order to create a chapter in Davis County. It was named the Sego Lily Chapter NSDAR to pay honor to the state flower of Utah. The following poem demonstrates why we found this name choice so endearing. “Sweet native lily of the western plains, to us you are a sacred flower. of Pioneers who trekked uncharted ways to find a home. Unless otherwise noted, our meetings are held on the third Saturday of the month, September through May, at 10:30 a.m. If you are interested in attending, please email our chapter regent for a meeting location.